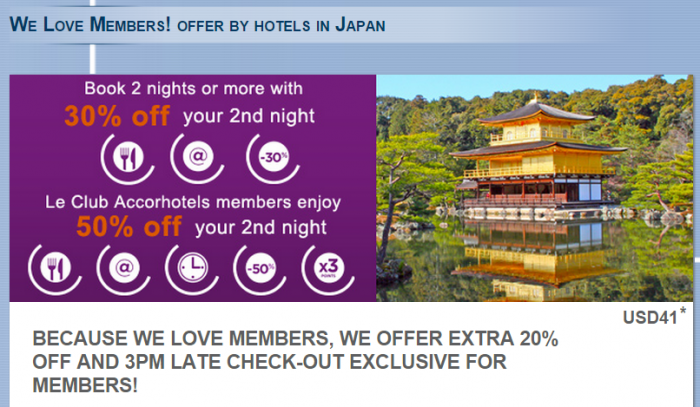 Le Club Accorhotels has launched a new discount offer for stays at participating hotels in Japan between May 11 and September 30, 2015. Le Club Accorhotels members can get 50% off of the second night (25% off discount really over the stay) and be eligible for the triple points promotion until July 31, 2015. Note that the discount for the 3rd night is 25%. Just an offer to keep in mind if you are planning to stay at any of the cities and participating hotels this summer and early autumn. – Offer valid for bookings made between 1 May 2015 and 31 May 2015 for stay(s) between 11 May 2015 and 30 September 2015 (both dates inclusive and based on local time of the hotel in which room(s) are being booked). -50% discount on a second night and 25% off from a third night for Le Club Accorhotels members, and 30% discount on a second night and 15% off from a third night for non-members. The offer includes daily breakfast and free Wi-Fi during your stay. Plus, 3pm late check-out for Le Club Accorhotels members (subject to availability). A minimum of two nights are required. – Booking cannot be changed, canceled or exchanged, and it cannot be combined with other discounts or special offers. The rates are not eligible rates for the purposes of earning benefits in any third party loyalty program. Bookings must be made 7 days prior to your arrival date. -You must provide your loyalty card number or member number when making your reservation, and present your card at the reception desk of your hotel when you check-in for your stay. -General Le Club Accorhotels terms and conditions apply to the “We Love Members” offer. Next articleREADER QUESTIONS: Marriott Rewards, Airline Frequent Flier Programs, IHG Member Exclusive Rate & Qualifying Stay, Delta’s Medallion Program & Downgrade On AA Award Ticket?